Shrubs and bushes can add beauty and privacy to the yard, they can hide eyesores, and they can memorize us with an amazing aroma. But it can be hard to decide between them when there are so many different varieties, shapes, colors, and sizes to choose from. One of the reasons that people plant bushes is to disguise landscaping eyesores. Bushes can hide air conditioners, swimming pool pumps, and trash can storage areas. Another problem that shrubs and bushes can solve is lack of privacy. However, they can also solve other problems. The type you choose depends on what goals you wish to accomplish. By choosing shrubs that bloom, you add color and interest to the landscape. There are also scented hedge, bush, and shrub varieties that give off a wonderful aroma. 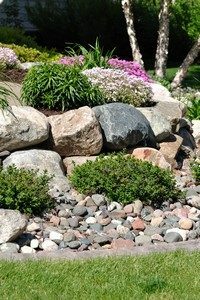 Evergreen shrubs will provide interest all year long. What problems do you need to solve? What are your goals? Hydrangeas are very popular because of their beauty and the variety of blossom colors to choose from. They have huge blossoms with tiny flower petals that are intricately beautiful and delicate. Burning Bush shrubs set a landscape ablaze. The fiery color creates a landscape showpiece. Also, there is the beautiful Golden Bell Forsythia shrub. All of these flowering shrubs are good choices for landscapes in our area. Hydrangeas not only make your yard smell great, the contrast in the color of the blooms and the deep green of the foliage is really beautiful. They love to grow in shaded areas, and they love the soil and climate in our area. With ornamental flowering honeysuckle, you smell the fresh, sweet scent every time you go outside. It’s a wonderful shrub that’s beautiful, aromatic, and perfect for our climate. Azaleas are popular evergreen shrubs that bloom during certain parts of the year. The foliage stays a lush green color even during winter, and they do like our soil. They are best to plant where they get dappled sunlight, not in too much shade or they won’t bloom. You can also choose among the different varieties of holly bushes that have dark green leaves and small red berries. This bush is great to control access to certain areas of your property. Holly bushes also look great next to the siding of a house or under windows. Arborvitae is an evergreen bush that can add privacy and beauty to a landscape. The most common varieties planted are the shorter varieties, but some can grow taller than a first-story roof. In fact, they can reach a mature height of up to 60′ tall, so be careful when choosing between them. Plant these in areas with full sunlight. 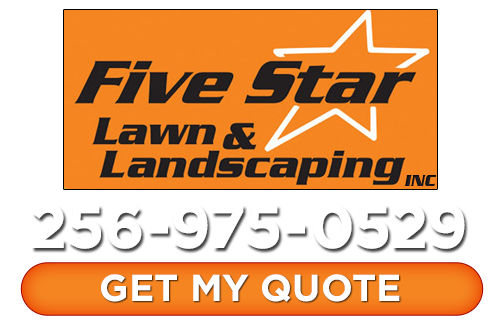 Call our landscaping and hardscape service pros at Five Star Lawn and Landscaping, Inc. today! To learn more about shrubs and bushes for landscaping in Huntsville, AL or surrounding areas, please call Five Star Lawn and Landscaping, Inc. at 256-975-0529 or complete our online request form.